Your recommended daily intake of water depends on various factors such as weight, activity level, health status, and the climate in which you live. On average, the recommended daily fluid intake is half of your body weight in ounces. For example, if you weigh 150 pounds, then you are suggested to drink 75 ounces, or about 9 and a half cups of fluid a day. Tea, coffee, juice, fluid from fruits and veggies, as well as broths also count towards fluid intake. However, caffeinated drinks such as coffee and cola also act as diuretics since caffeine is a stimulant; therefore these types of fluids can actually dehydrate you if consumed in excess. 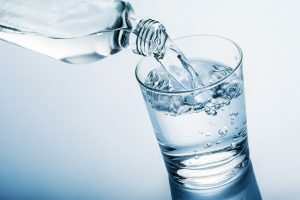 Those who live in hot climates, have a fever, or have lost fluids due to diarrhea, vomiting, or other illnesses may require above the daily suggested fluid intake. However, those who have kidney disease or conditions like lymphedema may be told by their healthcare provider to restrict their fluid intake. When you are trying to lose weight, you may have been told to drink more water to feel fuller so you will eat less. Also, you may have heard that drinking more water will help reduce bloating. Although these two suggestions may be effective, research shows that there are other reasons water intake may benefit weight loss. In the journal Nutrients, researchers observed 16,000 subjects from Spain over 8.5 years. Over the course of the study, 900 of these subjects became obese. Those who switched a glass of beer for a glass of water each day reduced their risk for obesity by 20-percent. Furthermore, doing the same for sugar-sweetened beverages reduced the risk of becoming obese by 15-percent. Replacing other beverages with water such as whole milk, reduced-fat milk, skim milk, wine, spirits, diet sodas, coffee, orange juice, and other juices did not reduce obesity risk. The study cannot confirm a direct cause and effect link of water intake and reduced risk of obesity. However, regardless of the study results, it is always good to reduce drinking your calories. When you reduce consumption of calorie-laden beverages, you will reduce daily sugar intake, in turn leaving more daily calories to use for consuming foods that will provide more nutritional benefit. By reducing daily sugar intake, you will be able to also better control blood glucose levels in your body. taking supplements such as Glucarex by Vita Sciences. Glucarex contains vanadium and bitter melon which have both been shown to support healthy blood glucose levels. Can Meditation Help Those With Anxiety Focus? Even after thousands of years since its development, meditation is still used as a way to develop the mind and evolve spiritually. However, even though the term “meditation” may provoke thoughts of religious context, the exercise itself simply involves a specific, comfortable posture, a focus of attention, and an open attitude. Specifically, this may involve repetition of affirmations, relaxation breathing, and clearing your mind of extraneous thought. According to the National Institutes of Health, meditation holds significant health benefits. In particular, research has shown the exercise to benefit those with anxiety, depression, insomnia, and even irritable bowel syndrome. Furthermore, in those with anxiety, meditation helps diffuse worries by improving focus on the present-day. A recent study in the journal Consciousness and Cognition looked at a group of 82 people with anxiety. Subjects were asked to perform a computer task and were interrupted frequently to test their focus. Next, subjects were divided into a meditation group and an audio story group. Results show that those who meditated had greater focus in the second half of the study then those who listened to the audio story. Therefore, it is safe to say that meditation exercises show promise for helping those with anxiety. Researchers of the study state that mind wandering account for nearly half of a person’s consciousness. Furthermore, when those with anxiety wander off into repetitive off-focus thought, they may have trouble learning, completing tasks, or functioning safely. However, the National Institutes of Health want to remind you that meditation should not replace primary conventional care of health conditions. 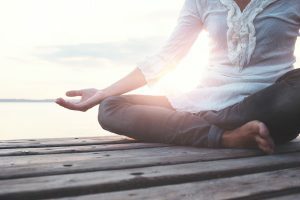 What Are Other Ways to Help Reduce Anxiety? Exercise on a regular basis for at least 30 minutes a day; low impact exercises such as walking will do the job. Schedule “me-time” every day engaging in an activity yo love to do such as reading, painting, watching a movie, or cooking; do something that relaxes your mind. Delegate tasks on your to-do list; get others to help with some tasks or schedule some things for another day. Stay connected with a support system through family, friends, coworkers, or community and religious organizations. Use essential oils such as frankincense and lavender to provide a calming scent when practicing relaxation breathing. You can either place oils in a diffuser, or dab on wrists and neck for a more concentrated scent. Drink herbal teas such as peppermint to calm digestion or chamomile to help soothe the mind and promote sleep. Try a supplement such as Sereneo by Vita Sciences. Sereneo contains natural ingredients such as magnesium, chamomile, and valerian that have been shown to promote a boost in “feel-good” serotonin, relieve anxiety, and calm mind and body. Also, visit websites such as the Anxiety and Depression Association of America for more information on anxiety, treatment options, and ways you can support anxiety research. Can Diabetes Affect Your Brain Health? Type 2 diabetes is a condition of insulin resistance. This particular condition is related to obesity and inflammation versus Type 1 diabetes that is insulin-dependent. If uncontrolled, diabetes can lead to conditions such as tingling nerve pain in the hands and feet, slow emptying of the stomach also known as gastroparesis, and increased risk of heart disease. 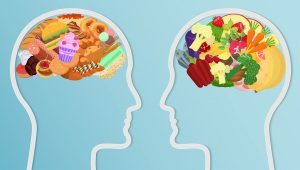 Furthermore, a recent study has found a link between brain health and type 2 diabetes. A 2017 study in Diabetologia looked at Asian adults between the ages of 30 and 60 years old. This study looked at the brain health of those with diabetes versus those who did not have the condition. Subjects underwent MRI brain scans and tests to measure memory and thinking skills. Test results showed those with diabetes to have decreased cortical thickness as compared to those without the condition. Furthermore, additional thinning of the temporal lobes was found in overweight and obese subjects with the condition. A 2009 study in Intelligence found that cortical thickness has been linked with cognitive function Therefore, it can be suggested that those with diabetes are at risk for decreased cognitive function if the condition is not controlled. How Can Brain Health Be Improved? Consume a carbohydrate-controlled diet to better control blood glucose levels. You can control blood glucose levels by limiting concentrated sugar intake and increasing fiber intake. For example, decrease intake of sugary drinks like colas and juices as well as candies and baked sweets that contain concentrated sugars. Fruits, vegetables, and whole grains like quinoa, brown rice, and oats are fiber-rich. Consume antioxidant-rich foods such as fruits and veggies to help decrease inflammation in your diet. In addition, the omega-3 fatty acids in fatty fish like salmon and in plant-based oils, nuts, and seeds can also prevent the cell damage related to inflammation in the body. Stay active daily to help better control blood glucose levels and to help with stress management. For example, just 30 minutes of moderate activity like walking for 5 times a week can help you maintain weight, lower stress, strengthen your heart, and in turn decrease inflammation in the body. Take high quality supplements like Glucarex by Vita Sciences to help better control your blood glucose levels. Glucarex contains ingredients like chromium and alpha-lipoic acid, which helps to keep existing blood glucose levels within normal range. Visit the American Diabetes Association website for more ways you can control your blood glucose levels and keep your heart and brain in the best health possible. Karama, S., et al (2009) “Positive association between cognitive ability and cortical thickness in a representative US sample of healthy 6 to 18 year-olds.” Intelligence, 37(2): 145–155.